How do you get this to default to your google apps account? This is just AWESOME. Thank you Google! I see the option on my Macbook Pro, but there is no way to add a handler. Go to Gmail first it will request if you want to use gmail first. Make sure you have the latest update of Chrome. Thank you Gwired for sharing this information. I found it. Thanks. Chrome just hadn't updated yet. All good now. I was using a plug-in for Gmail before. This makes things a bit cleaner. Not sure how but I have been using gmail as my mail handler for years. 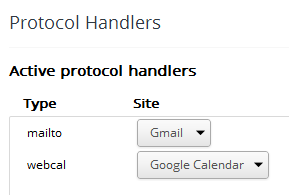 I did not allow the initial prompt from gmail to allow the handler, then I accidentally deleted it from the manage handler box in chrome settings. How can i get it back? - Unset the handler in Chrome. I started using gmail as a temporary thing but I've stuck with it cos I like it! Is there a group policy setting for this yet? Yes can you set this for all users yet? I recently came across your site and have been reading along. I thought I would leave my first comment. Great post, concise and easy to understand. I like this post. I found out that this site is very interesting and informative. This works just fine, but can I tweak it so the Gmail compuse screen opens in a new tag rather than a new window? I hate it, cause it makes Google Chrome the default handler along with Gmail. I don't want a system-wise change, I want the email links to be handled by gmail within Google Chrome only. TO ADD NEW PROTOCOL: in Windows 7...go to Control Panel\Programs\Default Programs\Set Default Programs...choose your email handler and make sure you go in and click box next to allow for Mail To: protocols for Google Chrome. "...choose your email handler..." no, that will simply make your desktop email client respond to mailto links in chrome. It will not make gmail the default mail client for mailto links. if this is not working, try going to any other mail client on your pc and remove the default application tick. Does this work in Ubuntu Linux? I only just recently (in the past month) started using Google Chrome as my only browser. I have version Version 22.0.1229.79. I'm using the most up-to-date Ubuntu Linux available at this time, which is 12.10 quantal (beta). I have never seen gmail ask me if it can be the default handler, and it's not available in Ubuntu's System Settings -> Details either. When I go to Chrome's Settings, Show advanced settings, Content settings, Manage Handlers, it's empty and there's no way to add anything. So, does this work in Ubuntu Linux? Since this feature doesn't seem to work in Ubuntu Linux or the most recent version of Chrome, I don't know which, I just installed "Mailto: for Gmail" from the Chrome Web Store. It worked perfectly. It was the first of many similar extensions listed when I searched on "mailto gmail". It turns out Chrome now displays a protocol handler icon in the URL bar. THANK YOU! I finally found something that worked! You rock. Mystery solved. Thanks for the link. BTW I am using CHROME Version 26.0.1410.28 m, on windows 7. Using Version 27.0.1453.12 dev of Chrome - cannot get it to open Thundrebird as the default mail handler. This is in Linux. Using Chromium Version 26.0.1410.43 (189671) and cannot get Mozilla Thunderbird to be the default mailto: URI protocol handler!